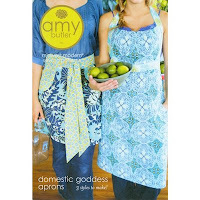 Amy Butler's new Apron Sewing Pattern features 3 modern apron designs for you to make your own Domestic Goddess aprons. This pattern includes the half apron, pleated-bodice full apron, and split-bodice full apron styles. Fabric requirements are given for 3 apron lengths, including short, mid-length, and long. These figure flattering styles are both functional and fashionable! Wear your apron to keep your clothes clean while cooking, cleaning, or crafting. Dress up a favorite pair of jeans and t-shirt for a casual evening with friends. 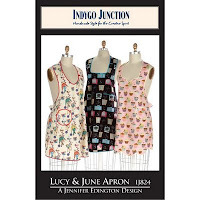 The Lucy & June Retro Apron Pattern is a retro style apron design by Jennifer Edington. You'll have a number of options to choose from with this versatile apron pattern, including four neckline, two hemline, and eight pocket design options. This apron ties at the back for a completely adjustable fit. A bias tape finish completes the look. This is the perfect apron pattern for those fun retro style fabrics. 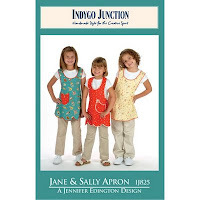 You can make a matching apron for your daughter or granddaughter with the Jane & Sally Retro Apron Pattern. This sweet retro style apron for kids includes a big sister version that slips over the head and a little sister version that has a velcro-type fastener at the neck. You'll choose from 2 hemline and 8 pocket design options. The bias tape finish gives a look reminiscent of the 40's-50' era. Kid's will enjoy cooking and baking in an apron made just for them! Visit the Apron Sewing Patterns section to see our entire selection of apron patterns. You'll find a range of apron designs from a variety of popular apron designers, including The Apron Lady Designs, Vanilla House Designs, Paisley Pincushion, Threaded Pear Studio, and Taylor Made Designs. Making aprons is a fun and creative way to spend your time. Many apron patterns use minimal pattern pieces and basic sewing construction, making them an ideal first project for beginners to learn to sew. Visit Weekend Kits to choose your favorite apron patterns and be ready to make an apron or two on your next Weekend at Home! If you're looking for a quick & easy craft project for spring, make sure to see our newest mini quilt kits from Quilt in a Day. You'll find them in the Quilt Kits section of the store. Mini quilt kits are ideal for beginners to learn to quilt & sew. 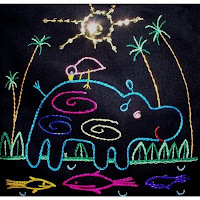 They include all of the materials needed to complete the mini quilt project, including pre-cut fabric strips, fussy cut picture, backing, binding, batting, detailed instructions, and a magnet. The term "fussy cut" refers to the attention to detail given to cutting out a very specific part of the fabric. 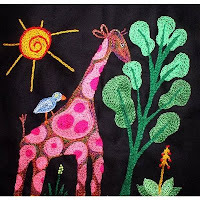 In these kits, the fussy cut picture is featured in the center of the mini quilt. Mini quilts are easy to complete, making them a fun weekend craft project. 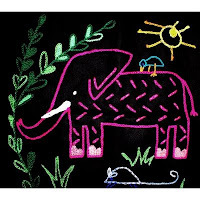 They're a perfect first project for teaching children how to quilt & sew. They're also a quick & easy craft project for experienced quilters to make a mini quilt in just 2 hours! 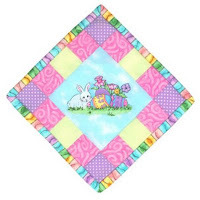 Your completed mini quilt will be ready to display as a decorative wall hanging in your home or in the office. Use the magnet to easily attach these quilts to any metal surface, like the kitchen refrigerator. 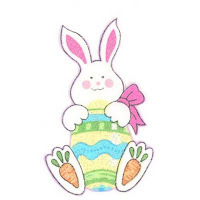 It's a fun way to decorate for Easter! You'll need a sewing machine and a few basic sewing supplies, including thread, pins, and scissors, to complete your mini quilt project. If you're new to sewing, quilting, or crafting in general, make sure to visit the Sewing.org website. You'll find a variety of free sewing & craft projects, learn to sew instructions, and more! Follow the Guidelines for Sewing link for a complete list of articles to view and print as a ready reference. 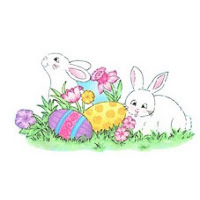 Weekend Kits offers a variety of craft kits for every season. Visit the Seasonal & Holiday Kits section and be ready to create something new on your next Weekend at Home!